Today was a good day. Three really nice things happened, and I’ll go backwards in the order of their appearance. Tonight I went to Kent State’s Trumbull County campus, a satellite of the main campus which is actually in Kent, Ohio. The Trumbull campus is a place where a lot of students in this region get a start, and tends to function, in its own way, hovering somewhere between community college and full-on university. I began my own undergraduate studies there back in 1993, staying for a year before moving on to Youngstown State University. It’s a place where small town-y people like myself go for a variety of reasons: tied to the region out of inability to access resources to take them to a different university, tied to a marriage or children or a job they can’t afford to leave or don’t want to leave. I was the sort of kid who had grown up in so small a rural community that my graduating class was around 50 people. The prospect of going far away to school was really frightening to me, but aside from that I didn’t really have a lot of people around me that could help me figure out how to get funding to go away in the first place. So I started my education beyond high school at this little campus. This afternoon I went back to meet students in classes who have been reading my first novel, set of course in and around their own home places, and to give a reading. It felt like a bit of a homecoming (as Youngstown, which I write about as a setting often, is sometimes mistakenly thought of as the place where I grew up–it’s not, it’s where I came to eventually complete college, and is my second home, really; Ami, Japan being my third after that), and I saw people I hadn’t expected to ever see again (an old schoolmate from kindergarten through senior year’s mother) and people who knew me when I was a child, though my recollection of them, like a child’s, was a bit fuzzy. I love this sort of thing. Secondly, I was asked by The James Thurber House in Columbus, Ohio to come this summer, the day after my birthday in July, to participate in a reading by New Voices in Ohio for their literary summer picnic series. I’ve added it to my list of appearances on the site, and am incredibly excited to go and do this, even though it’s months away. 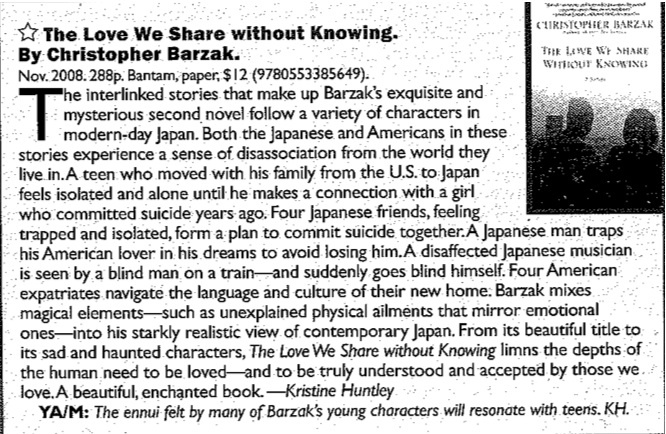 Indeed, I don’t know if people who have grown up in the post-Cold War years have a stronger literary advocate than Christopher Barzak. Half of this is that Barzak gets it: it’s not that Barzak’s young characters are apathetic, it’s that they desire to feel strongly and truly in a time when all existing cultural systems of thought and action have been revealed as simplistic, confining, and false. Too often cultural traditions seem at war with a desire for self-awareness and self-expression, sharing and intimacy. Magic and the supernatural in Barzak’s writing become a way of articulating the disconnect between what characters are told of the world and their own intuition of its possibilities. So many of Barzak’s characters are ghosts because they are unable to instantiate themselves, unable to find anyone able to listen to what they need to say. So many of his characters are able to speak only through impulse decisions and actions that break with norms and traditions—his characters reflect a sense that the only choices that are truly ours, are our impulses: to fall in love, to leave, to remain; a lover, a nation, a life. And there’s plenty more lovely review writing where that came from, courtesy of one Matt Denault, who has provided a really amazing perspective on some of the aspects of my novel. Stuff like this, too, I love. It’s one of the things about writing that makes it hit all the right spots for me. Sending out messages in a bottle, getting messages back in return. I’d say I wish every day could be as nice and good a day as today was, but then, if that were so, I’m sure days like today wouldn’t feel at all special. Recently, while communicating with friends and acquaintances on Facebook and MySpace, I’ve been reading the user status posts, and also the information sections where people describe themselves, and have been coming across self-descriptions in which people state that they are happy and live life to the fullest. It’s an interesting statement to make, and I’m glad to see so many people who are happy with their lives, but I sometimes wonder what living life to the fullest looks like to other people. So that is my question, if you’ll be so kind to indulge me. What is a full life for you? Specificity is what I’m hoping for here. This Saturday will be one big party downtown. Why? Because I’m throwing a party for the release of my new book, which comes out tomorrow, The Love We Share Without Knowing. There will be food (cross-cultural selections, since the book is set in Japan) and drink (wine and sake), and art (from the Artists of the Mahoning Commons), and though last year we also had music, this year we will be directing you down to the Cedars Lounge, where my favorite local band, The Zou, will be celebrating the release of their first CD, Archeopteryx. Together, it will be a celebration of the local talent that inhabits this little Rust Belt city. The Love We Share Without Knowing Release Party will be held at the Oakland Center for the Arts, on Boardman Street downtown, from 7-10 PM. Come drink, be merry, listen to me read a section of the novel. Then head down two blocks to Cedars for the Zou’s New CD Release Party from 10 to 2 PM (23 N. Hazel). It’s going to be a fun evening. I hope to see you out. My Japanese mom sent this picture to me today. Apparently the new book has arrived at her doorstep earlier than it has here. 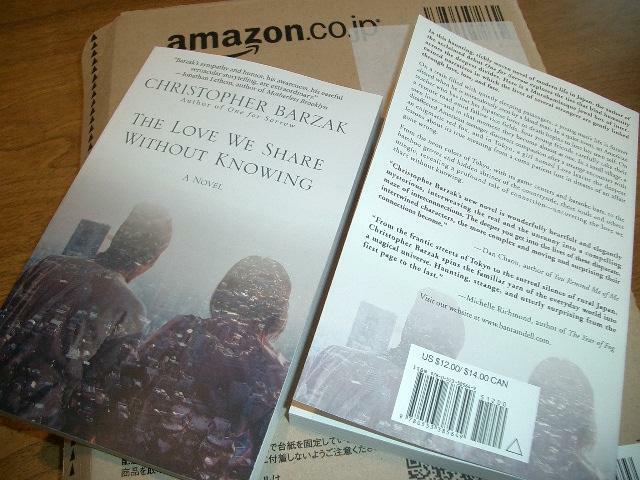 I love seeing this photo of the book, in Japan now, where I wrote it. It seems like ages since I gave a writing (or publishing?) report, but here it is. In August my short story “The 24 Hour Brother” will appear in the new issue of Bantam Spectra Pulse. At the end of November, my second novel, The Love We Share Without Knowing will be released by Bantam Books (very excited, very anxious, very everything, as usual, about the release of a new book). In December, a short story called “A Thousand Tails” (also a section of the second novel) will appear in Firebirds Soaring, a YA anthology edited by Sharyn November. And today, I found out that my novelette “The Ghost Hunter’s Beautiful Daughter” (set in Warren, Ohio, for local readers) will appear in the October/November 2009 issue of Asimov’s. This is the first time I’ve sold a short story to Asimov’s, and I’m really happy and excited to see a story of mine appear there. More later as it happens. 1. It is beautiful outside today. I am going to spend most of the rest of the day out in it after writing this. 2. My kittens are adorable. Seriously, no one has better ones. They’re sitting in the window watching birds together at the moment. Last night, after a serious catnip binge, they chased each other around in circles in the kitchen, sliding on the floor like little kids in socks. It doesn’t get better than that. 4. Netflix has the most awesome shows you can watch online without actually having to have the discs delivered. I watched Heroes this way last season when I didn’t feel like being tied down to a weekly day and time. Now I’m watching Weeds. Did anyone see this show? It’s got some good writing and some bad writing going on it, but it’s captured me. I love the intro song to the show. And the crazy characters. 5. It’s summer. Screw working for a while. I just got done working! I am totally going to go do some summery things and let myself relax a little. 6. I have strawberries growing in my side garden. I love having a side garden, as well as three back gardens. Now I just have to get them all into shape and maybe get a nice stone table (I would so love it to be stone) to sit at out there in the shade and eat at for the next three months. Outside is sounding more and more appealing to me. It’s been brought to my attention that my novel One for Sorrow has made it onto the list of finalists for Best First Novel in the Locus Awards this year (thanks Rick and John!). Very excited, of course, especially to be named among that list of other first-time novelists. Congratulations to everyone in all the categories. Voting in this year’s Locus Poll and Survey has closed. Winners will be announced in June at the Locus Awards Ceremony in Seattle, June 21st. Here are the finalists — the top five ranking items — in each category, listed here alphabetically by title, then by nominee. A broken-down, deserted house also figures in “It’s A Wonderful Life,” you might remember. What’s wrong with Northeast Ohio? Why can’t we seem to catch up to the changing world? A lot of it is old-school mindset that even young people who grow up here have, including me. There are all these echoes that you pick up when you grow up here, and you begin to believe certain stereotypes about yourself; and I’ve said many times that we have an inferiority complex. I look at it and it’s basically an insult to myself. I’m sure I could have made a life somewhere else, so have I settled for second rate? And that’s not true. I have a 4-minute commute, I have a house I could never afford in other markets, and I have things that I would struggle to get in other places. Plus, our thrift stores here rule.